Casta Flavus, an Imperial mage, is an agent of Hermaeus Mora sent to rouse you from your sleep and inform you of Mora's interest in you. 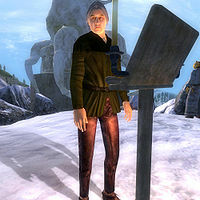 Once you have accepted Hermaeus Mora's quest, Casta Flavus is removed from the game. He doesn't waste his time on irrelevant chatter. The first time he introduces himself to you, Casta tells you, "You are summoned by the Lord Hermaeus Mora. He sees your path as he sees all things. Make your way to his shrine. ", and after that he will only say, "Go to his shrine. See what lies ahead." Casta wears a set of lower class clothing: a dark green shirt, laced leather pants and a pair of stitched leather shoes. He knows a leveled set of mage's spells. Hermaeus Mora: Capture one soul from each of the ten races of Tamriel. This page was last modified on 25 March 2018, at 02:46.